Swedish fashion company H&M will launch its eighth fashion brand later this year, with the first outlet opening in London this autumn. The new brand, Arket, will provide "simple, timeless and functional designs" including clothes for adults and children, and household products. It will sit in a slightly higher price segment than the main H&M brand. The move comes as competition online and on the High Street is squeezing profits at the fashion giant. After London, more Arket stores will follow in Brussels, Copenhagen and Munich, and the new brand will be launched online. The new stores will also stock external brands, and some outlets will include a cafe offering Scandinavian-style food. Bernadette Kissane, apparel and footwear analyst at Euromonitor International, said on paper the plan looked "promising". "The company's results have been falling short of expectations recently, consistently outpaced by key rival Inditex," she said. "Rather than adopt a faster sourcing strategy to compete, the company has opted to introduce new brand Arket to effectively cater to shifts in consumer behaviour." H&M already operates a range of High Street brands including Cos, & Other Stories, Monki, Weekday and Cheap Monday. But the firm said market conditions were difficult for fashion retailers as digitisation is changing both shoppers' behaviour and the way fashion companies operate. H&M pioneered fast fashion alongside Zara's owner Inditex. 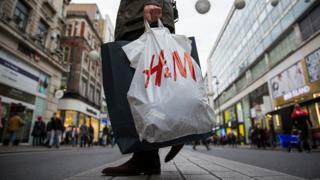 But Inditex has overtaken H&M in recent years to become the world's largest fashion retailer. The company's profits are also being squeezed by online competition from retailers such as Asos, which offer a fast turnover of fashion styles in response to customer demand. "Retail is going through a challenging period of change in which customers' shopping behaviour and expectations are changing at a fast pace as a result of growing digitalisation," said H&M's chief executive Karl-Johan Persson in a statement accompanying the firm's latest financial results. "For fashion retail in general, market conditions were very tough in many of our large markets in central and southern Europe and in the US, and this was reflected in our sales," he added. H&M reported a 3.4% drop in net profit to 2.45bn kronor ($275m; £220m) for the December to February period, the first quarter of the company's financial year. Has this dress been to more countries than you?